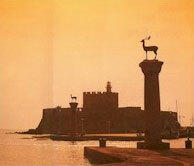 Greek Island Cruises, Dodecanese Rhodes Cruise. 7 days. A visit to the Greek Islands of Rhodos, Simi, Kos, Kalymnos, Patmos, Samos, Kusadasi and Ephesus in Turkey and Samos on the M/Y Theodora. Rhodes is the largest island of the Dodecanese island group where the sun rules all year long and the summer extends well into the other seasons, warming them with its breath. The city of Rhodes has two faces, on one hand the old town which is encircled by medieval castles with narrow lanes, beautiful stone mansions, churches, the Knight’s Castle, the Knight’s hospital and the Castello, and on the other hand the new city with its wide streets, beautiful buildings, glamorous hotels, shops, cafes, discos, night clubs and casinos. One of the neoclassical building houses a great collection of Antiquities. To the south lies the Monastery of Archangel Michael, one of the places of greatest interest on the island. The monastery has brilliant Byzantine frescoes and an engraved temple full of golden offering. The islanders occupy themselves with fishing and sponge diving. Kos is a slim fertile island with a cool and bracing climate. The island's fame is due mainly to the immortal Hippocrates, the father of medicine, who was born in Cïs (460 BC) and practiced medicine there. After the death of Hippocrates (357 BC), the Asklipion medical centre was built by Asklipios, whose school of medicine was one of the best known of ancient times and he practiced medicine following the methods inherited from Hippocrates for various cures. 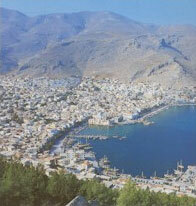 The principal town is also named Kos, is a garden town, cheerful and pretty with many local attractions. The island of sponge divers which lies to the south of Leros, affords yet another image of a typical Aegean Sea island. The intrepid sponge divers of Kalymnos sail away in their boats each spring and their departure is a moving and momentous event preceded by impressive religious rites. After five or six month’s hard work the sponge divers return to their island. Then all over Kalymnos one feels the sense of relief and joy. The whole island puts on its very best face and prepares to greet its toil-worn and weather-beaten sailors with local dances, feasts and banquets. The whole atmosphere of Patmos is somehow biblical and certainly peaceful. As you sail towards this most sacred of the Aegean islands, your eyes will hardly stray away from the massive and formidable Monastery of St John the Divine, which dominates the island. It was built in 1088 and it has something of the look of a medieval fortress, with its formidable array of towers, cupola, belfries and battlements. St. John spent two years on Patmos in a grotto, where he received and later dictated The Revelations to his pupil Prohoros. This Sacred Grotto lies to the left as you climb from Skala, the small harbour, to reach Hora. 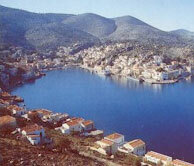 Samos is an island separated from Asia Minor by the narrowest of straits. Mythology named Samos as the birthplace of the goddess Hera and the ancients used to call the island Parthenias in honour of the Virgin Goddess. In the peak of its prosperity around 550 AD Samos produced the philosophers Pythagoras, Epicouros and the mathematician Aristarchos. Samos has managed to retain its dignified character. Kusadasi, known as the Island of Birds, with its old caravanserai, white minarets, shady terraces, where one can sit and sip raki and a main street lined with little shops offering a thousand and one tempting bargains, is a lovely little port built along the shores of a glittering bay around a tiny islet covered in flowers. During its Golden Age (2nd century AD), the city had a population of about 300,000; it monopolized the wealth of the Middle East and it was one of the principal ports of the Mediterranean. As a commercial and financial power, Ephesus was also a centre of intellectual activities. The city was adorned with splendid monuments, theatres, temples, agoras, gymnasiums, libraries etc. 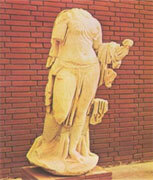 The protector of the city was Artemis, the goddess whose temple was considered one of the Seven Wonders of the World. The Ephesians were still worshipping Artemis at the dawn of Christianity when St Paul came to the city to win converts and when St John arrived in their midst, accompanied by the Virgin Mary who spent the last days of her life in a small house on a hill near Ephesus. Please note that the itinerary is tentative and may be subject to change due to client demand, weather conditions and/or Captain’s duties and responsibilities concerning passenger safety and well being. Cruise itinerary may be amended to include time extensions or visits to additional ports of call (ie. visits to additional or other Greek Islands and interesting places in Turkey) provided that reasonable notice of intended itinerary changes this has been requested and agreed in advance.